Share the post "Album review: LA GUNS – The Missing Peace"
To be fair, I am a big fan of L.A Guns. Now before you assume that this review is going to be a one sided love fest, let me assure you that this is an upfront and fair opinion on the band’s new album “The Missing Peace”. There is an undeniable musical chemistry between vocalist Philip Lewis and guitarist Tracii Guns, one that has been missing for the last twelve years. Whatever had once stopped the two working together has been put aside and the pair have reconvened their musical partnership to great effect. Now, although I was pleased to hear this album was on its way, I was also a little apprehensive – what if it was crap, or an effort at a last gasp money grab. I needn’t have worried. The album has a similar feel to 1994’s “Vicious Circle” (incidentally, this was the last album of original material from the band’s classic line-up), not trying to recreate the sound of their first two albums yet still staying true to their past. With a new line up completed by guitarist Michael Grant, bassist Johnny Martin and drummer Shane Fitzgibbon, L.A Guns these days have the energy and drive of a band half their age. A rather in-house affair, “The Missing Peace” was produced by Guns, engineered by him and Fitzgibbon, songs written by all band members and has cover art designed by Mrs Lewis, and it is that feeling of attention to detail that stamps LA Guns right through this whole album. The album contains great guitar work and vocals throughout, as you would expect, and there is no filler here. 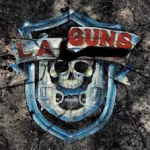 From the first bars of opening track “It’s All The Same To Me” it is clear L.A Guns are back, first single “Speed” includes those little guitar runs that Guns does so well and “Don’t Bring A Knife To A Gun Fight” literally strips back the last few decades. There are also some more mature sounding moments in “The Flood’s The Fault of The Rain” , “Gave It All Away” and title track “The Missing Peace”. On “Sticky Fingers” we see the return of the Theramin, “The Devil Made Me Do It” and “Baby Gotta Fever” have a classic feel and ballad “Christine” could easily hold its own against the band’s established favourite “The Ballad of Jayne”. This entry was posted in ALBUM REVIEWS, ALBUM REVIEWS (Mobile), All Posts, The Best of 2017 and tagged album, glam, LA Guns, metal, Missing Peace, Phil Lewis, review, rock, sleaze, Tracii Guns. Bookmark the permalink.